On Call, Vol. 1, No. 3 - Physical Plant: The Set... "St. Elsewhere's Silent Co-Star"
She had no lines and received no on-screen credit. No one thanked her at the Emmy Awards. And when her services were no longer required, she was discarded. Yet, week in and week out for six years, she stood at the ready, and supported her fellow actors with quiet grace. Who was this MVP? ...the SET, of course. While the supposed hospital exterior (the Franklin Square House located at East Newton in Boston) got "top billing" every week, it was the interior - the Set - that comprised the heart and soul of ST. ELIGIUS and St. Elsewhere. STEPHEN FURST... "The rooms were very realistic - they were about the same size as a regular hospital. As soon as I put on that white coat and stethoscope, I always thought I was a doctor (laughs)." 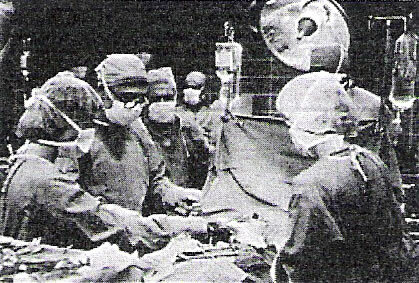 But as with any real hospital, the Set had its problems... they were not, however, man-made. MARK TINKER... "We were originally on Stage 9 and one day someone walked into the stage in the morning and noticed that this main truss bean was literally splitting in half, so that it was coming apart, and was going to fall. So they shored that thing up with like a 12 x 12, and that moved another foot during the night, so they said, 'Here's your choices - you gotta shut down. You can either wait while we redo the stage, and we don't know how long that's going to take, or you can tear the set down and rebuild it on Stage 3. This was show number seven in year one... I was in the middle of shooting an episode and the ceiling was going to cave in. So we said, we'll shut down, and let's rebuild. So for two weeks, 24 hours a day they reubilt the set onto Stage 3." JOHN TINKER... "It was because of earthquake damage...we had to move...same lot, different stage. We were on Stage 3 for the Lion's share. It was then that the CBS Studio City lot became the CBS/MTM lot. Now, it's called the Radford lot." MARK TINKER... "That's where the original Gunsmoke town interior stage had been, and which had the stink of horse urine seeped into the boards." ON CALL... Is that where you put the urology lab? MARK TINKER... "Yeah (laughs), exactly right! And now, CYBILL's show is there, so it's the same thing (laughs)." The set itself covered almost the entire floor space of Sound Stage 3. 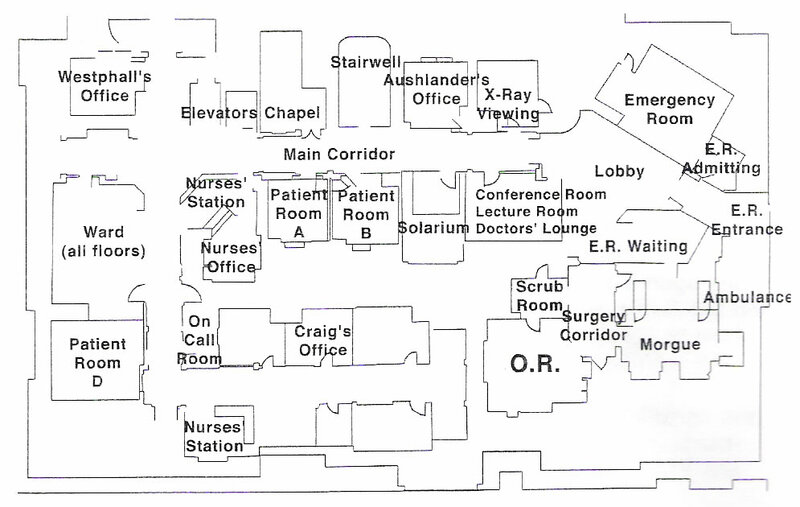 It was comprised of over twenty rooms or areas, including the ER, Lobby, Morgue, OR, Scrub Room, X-ray, and two Nurses Stations. One room located just off of the Lobby served triple duty as the Conference Room, Lecture Room, and Doctor's Lounge. There was one large Ward Room at the far end of the set, and two patient rooms located across from the Chapel. Another patient room faced On Call. Westphall, Craig and Auschlander each had their own offices, as did the Nurses. Most people don't consider the stairwells and elevators as rooms, but they each played integral roles. Both were located along the main corridor. Perhaps, though, the most striking aspect of the Set (and the most used) was the main corridor, measuring 165 feet in length. 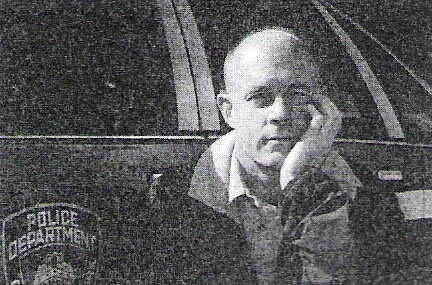 According to author Gary Yoggy in his article for Television Chronicles: "The corridor, which began at the ambulance entrance, was the site for much of the seemingly chaotic action, as well as background for the opening credit sequences identifying principal cast members... John McPherson utilized hand-held cameras that were always on the move, flowing from one situation to another, wandering down corridors and up staircases, flitting from the faces of doctors to the bodies of patients. The effect was arresting. It did, however, according to Christina Pickles, cause problems for the actors. 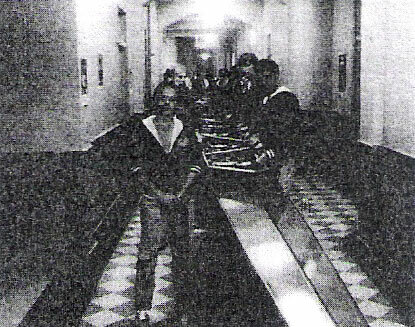 Everyone had to learn their dialogue well because if anyone failed on the way from the top of the corridor through the hallways and back to the Nurses Station, they would have to go back to the beginning of the scene and film it over again. 'No one,' she said, 'wanted to be responsible for having to go back to square one.'" Christina elaborated for ON CALL. CHRISTINA PICKLES... "We did walks down the hallway in one shot, so I would have to, for instance, be talking to Ed Flanders about a case, and he'd say 'And what happened then?' or 'What do you think?' And I remember my last line was 'How would I know, you're the doctor,' and that was the end of the scene. It took about 3 minutes, and it started at one end of the studio and went all the way through the long corridor to another part of the studio, and we were being followed by hand-held cameras. Sometimes there were dolly tracks, but most of the time it was hand held. You had a terrible responsibility to learn your lines because if you didn't it involved an awful lot of people. FRANCE NUYEN... "Each director had a challenge to himself that he was going to make one scene without a cut - going all the way around. The cameras were not on tracks, they were hand held - superb cameramen who walked backwards without going up and down. We had the best of everything. Sometimes it would take 50 takes - it was a challenge...like trying to make a hole in one." STEPHEN FURST... "We could run with the gurney. We could have these long, walking talking scenes (and we'd do it in one take because there was no coverage). I know we had one with Cindy Pickett - we did it in 32 takes...that was the longest of anything we worked on." ON CALL... Why so many takes? STEPHEN FURST... "Because there was three pages of dialogue and there were five or six people talking, and somebody would mess up, and you couldn't cut and pick it up because it's a one-shot deal." But if the hallways were chaotic, so too were the rooms themselves. FRANCE NUYEN... "The set was so crowded already - you move around those rooms elbow to elbow with all kinds of props - so there's not that much room. It looked like a big set, but those rooms were very small. They were able to move walls just enough for the camera to be able to pull back. Everything was crowded, particularly the O.R. scene. You couldn't move. It was terribly hot - the lights would heat up that small space - it was not always very comfortable. It was remarkable what they could do to give a sense of space. And if you were not shooting from one side, the you only had one wall there. The O.R., it seems to me, had four walls and that's why it was so hot in there. They would shoot so that they could pan around, going from the operating table, to the nurses doing something on the wall, to the other person with instrumentation. I know I was caught several times in the O.R. where I was beading (perspiration) because it got so, so hot." But as harried and hot as things might have gotten, the Set never quit, never showed up late for work, and never complained. It was a writer's dream come true. JOHN TINKER... "More than any set I've ever worked on, I loved that set. You could go down to that set (and I know I wasn't the only one who did it - Tommy used to do it too - we didn't know that at the time) but you'd go down and the place would just kind of talk to you, and give you ideas. It was as though it really had the history it had for all of us there." TOM FONTANA... "The set was extraordinary. The set became a character on the show. It was as important a character as any of the other actors, because of two reasons. One is, it was incredibly fluid - you know what I mean? It moved with a grace and a style that is rare for a set. And secondly because when you were on that set, you felt like you were in a real building - a real hospital. You felt the creak of the boards and the sputter of the flourescents. It so helped us as writers to keep the reality going. You just had to walk onto that set, and you were kind of flooded with this feeling of 'Oh my God...I'm really in the middle of this chaos.' Often, Masius, John Tinker and I would walk the set to try to see how long the dialogue needed to be to get from one door to another - we tried to pace it out ourselves so that we knew how much dialogue to have." JOHN TINKER... "Quite frankly, this set here on Chicago Hope doesn't talk to me at all. I walk on the set, and I think about, can I do this or maybe I can do that, but you walked on the St. Elsewhere set, and ideas revealed themselves to you in a very interesting way. And it was a very simple set. The set we have on Hope is far more complex, and far more expensive. It occupies three full sound stages. You can literally do one tracking shot from the E.R., then (quote) "go up" the elevator, in through the hospital part, and then across what we call the 'Skyway Bridge' into the office section. It's a huge set, and I like working with it, but not nearly so much as I liked working on the St. Elsewhere set. "It was a single sound stage and by the time we finished shooting, we had basically built one big loop of corridors. And we would re-dress things - revamp things. I loved that set. And I'm not speaking derogatorily of the set here on Hope. I just think I'm speaking appreciatively of the St. Elsewhere set and what I think is key to that set was the history built into it. For instance, I can think of a thing Tommy and Maish did about a door (episode 92), and Fiscus had to know what was behind the door...it had never been opened, he had never had the key for it, and through the episode you see him trying to get it open. Finally he just bashes it open, and it's just a brick wall. You couldn't do that on Hope." TOM FONTANA... "Let's face it, the TIME HEALS two parter was an homage to that set. The great joy of it was we were able to change the set five different times for five different decades, and she still looked pretty good." JOHN TINKER... "Again, it's our history, it's our past. It's where we came from, and that's what was so interesting." But for all of its loyalty and inspiration, the set was abandoned in the Spring of 1988. Still, studios had been konwn to kee sets intact for possible reunion movies, so there was no immediate finality. Unfortunately that came soon enough, though, and ironically, it was a St. Elsewhere alum who witnessed the demolition. CHRISTINA PICKLES... "My rememberance of the set was the day I was on the first episode of Roseanne show - I left to go to lunch and came back, and they were taking down the St. Elsewhere set, it was happening right in front of me...I was sobbing in my dressing room." And with the passing of the Set, went any hope of an easy transition to the possibility of a renuion, as Bruce Paltrow recounted in issue number one of ON CALL. BRUCE PALTROW... "Someone approached me a year or two ago...about doing a reunion, and I said I would not compromise rebuilding the set...(it cost about $300,000 to build in 1982) today it would cost about one million dollars to build." Still, television has become increasingly competitive, and it is not inconceivable that HBO, SHOWTIME, Turner, or others might eventually setp forward, order a series of St. Elsewher movies, and ante up for a reconstruction of the old set. But even if that happened, it would only be a replica...The old set is gone forever, and so is some of the spirit it embodied. Who knows, perhaps someone will locate the Fiscus mystery door, and Howie can build it into the set of this new talk show (a la Dean Martin). After all, his guests will have to enter from someplace, they'll just need a brick mason to assist them.